I’ve always been fascinated with Day of the Dead (Dia de Los Muertos). In my family, we don’t really discuss death much, and it’s usually done somewhat uncomfortably, so the idea of celebrating the dead and honouring their memory has always been fascinating. To be honest though, when I first saw that Melissa (of Rebel & Malice) was putting together the tour and was looking for participants I hesitated quite a bit, because well, I don’t celebrate it. Melissa, though, was very welcoming and encouraging, so thank you Melissa! She also sent some links with more info on the practice so we could learn a little more. After reading up I’ve decided that I’m going to try to incorporate Day of the Dead celebrations a bit into my family’s traditions. For my part in this blog tour I decided that the satin flowers I’ve been making for a few years now fit in perfectly with the tour. They’re bright and colourful and can be made in any colour. I went with a fuchsia pink satin for this one. It’s so pretty! Pink is the colour of celebration for Dia de Los Muertos celebrations and flowers are used as part of the decorations. Cut out the strip of satin depending on how full and tall you want your finished flower to be. For this flower I cut my strip of satin about 30″ wide by 3″ long (parallel to the selvedge). Wider than 30″ will give you a wider flower across and longer or shorter than 3″ will give you a taller or shorter flower. This also depends on fabric choice as well. Chiffon will give you a softer, “floppier” flower. So experiment to figure out what you like! Also, don’t be worried about keeping the edges too straight. I cut with my scissors and sort of eyeball it as I’m cutting out the strip, this will help with the look of the finished flower. Run a gathering stitch close to the folded edge using a long stitch length. You can do this on a sewing machine or do it by hand. I recommend back stitching at the beginning if using a machine. Carefully pull the thread to gather the fabric. Then roll the gathered fabric until you reach the end. Using a needle and thread stitch through the base of the flower a few times to keep it in place. I don’t have any pictures of this step because I didn’t want my kiddos to be watching; light a candle and bring the raw edges of your flower close to the flame. You want it to be close enough that the edges melt but not so close that the flower catches fire (you might want to keep a bowl of water next to you in case that happens, and just dunk the flower in the water. Don’t ask me how I know). You might need to go over the edges a few times. I also in various spots will bring the flower edges even closer and it will help give the wavy edge. Once you’re happy with how it looks, cut out two small circle pieces out of felt the same size of your flower base and glue one to the base of the flower. Sew the ends of the elastic together, overlapping by 1/2″. Apply glue to the bottom of the flower and place the sewn end of the elastic onto the base and layer the other felt piece over top. Voila! A beautiful hair flower! 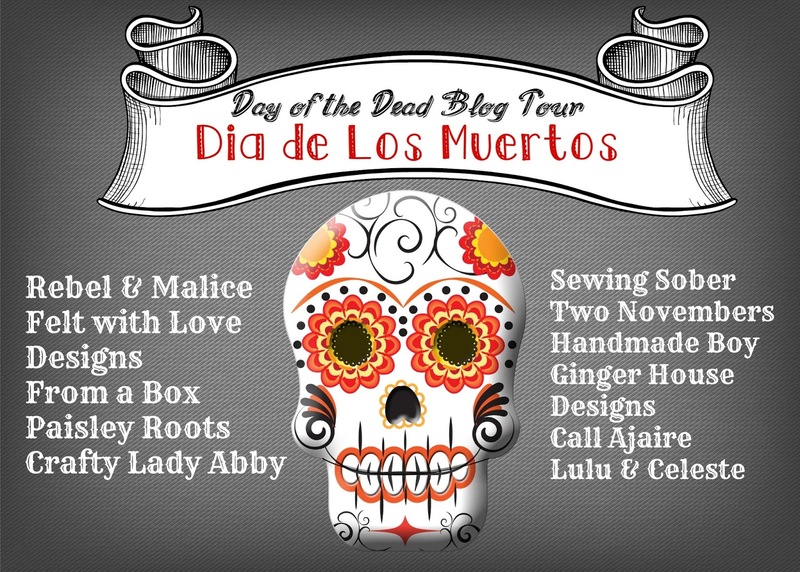 Check out the rest of the stops on the blog tour, and enter the giveaway below. Thanks for stopping by! Those are so beautiful! I love the full bright flowers! Thanks for having me! I enjoyed learning a little more about the tradition each day! These girls are just adorable!! Darling idea to glam up any outfit! Love it, so big & fun!